LENNOX has earned his place as one of the most heavily used sires in our breeding program. His progeny are very similar in type and performance to those of his sire, MASTERPIECE, with lots of thickness, volume and fleshing ability, but with less birth weight. His daughters have become some of the most prized possessions of our cowherd with outstanding milking ability, excellent udder design, plenty of fleshing ability and superb feet and leg structure. 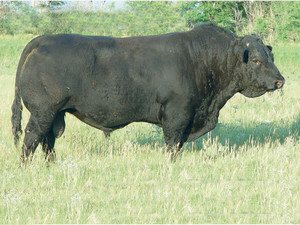 A LENNOX daughter, MAC PANORAMA 302P, produced MAC STERLING SILVER 43S, the $10,000 high selling bull of our 2007 sale. He also enhances the positive carcass traits of strong carcass-trait females. LENNOX is a very well-balanced bull combining outstanding performance and superb maternal traits with moderate birth weight and the ability to transmit strong carcass genetics.